Does Jublia Work for Toenail Fungus? Podiatrists call it Onychomycosis, but you may recognize this infection by a more familiar name, Toenail Fungus. Call it what you like, Toenail Fungus is a fungal infection that effects the toenail and the surrounding skin and can be very embarrassing and painful if left untreated. There are various treatments out there, but one topical solution has risen to popularity in recent years. 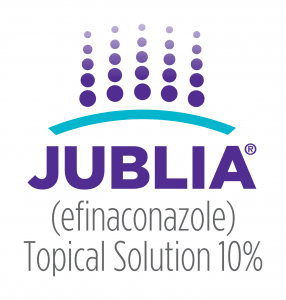 It’s called Jublia and if you’ve seen the advertisements this prescribed topical solution claims to treat the site of the fungus at the nail or the skin surrounding the nail. But does Jublia really work? Jublia reported over a 52-week trial period that 55% of its participants were fungus-free while only 26% stated they had noticeably clearer nails. Some doctors may suggest other forms of treatment and also warn their patients about the $400/month cost associated with Jublia as most major insurances do not cover the prescription. While you can’t totally avoid contracting a fungal infection It is important to remember Toenail Fungus is preventable and precautions should be taken to avoid this infection. • Heads, shoulders knees and TOES! Always wash your hands and feet regularly and keep your nails at a nice length, filing and trimming them as needed. Always dry your feet before putting on any sock or footwear. Wear good socks that absorb moisture and change them if your feet are sweaty. Much like your tootsies, keep your socks clean and be sure they’re dry before wearing. 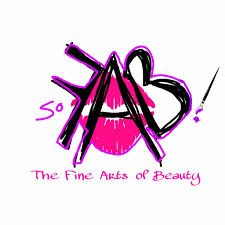 Use anti-fungal powder or spray – always! And she told you for good reason! Yes, picking at your nails and cuticles are a bad habit, but it’s also an easy way to get a fungal infection. If part of your foot-care regimen is treating yourself to a monthly pedicure, always go to a clean and reputable nail salon. Professional athletes aren’t the only people at threat of getting a fungal infection. In fact, you don’t even have to belong to a gym! If your feet perspire, you work in a wet environment, are over 60 or have diabetes, you are at higher risk of fungal infections. At Beaver Valley Foot Clinic we believe like any treatment, Jublia the results will be different for everyone. The only way to totally treat Toenail Fungus is by avoiding it all together. However, if you’re like the other 20% of the American population who will contract this fungal infection this year, you’re going to need the help of a Podiatrist. If you’ve had enough of this painful and embarrassing infection, look no further! 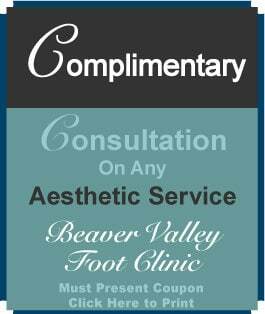 At Beaver Valley Foot Clinic we treat everything from fungal infections to stress fractures and ingrown toenails. If you’re looking for one of the most distinguished foot doctors in Pittsburgh, call Dr. Christina Teimouri, DPM at Beaver Valley Foot Clinic and schedule an appointment in one of our 6 convenient Pittsburgh area locations. Please call 878-313-FEET (3338) and visit us today! 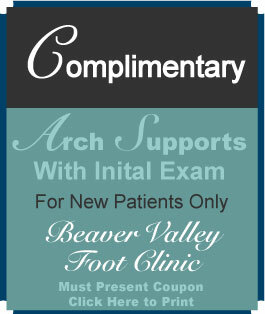 Beaver Valley Foot Clinic – Your feet are in good hands! or Body Beautiful has 10 locations in the Greater Pittsburgh area to treat toenail fungus with laser!